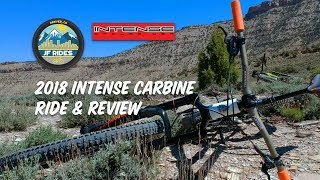 Exposure on-par with Moab's Porcupine Rim, but with fewer people and more singletrack. Bring plenty of water. Avoid the upper loop after rain. Watch where you are going, falling in some spots could be fatal. Stop by the Palisade Brewing Company for a pint after your ride. Visit Rapid Creek Cycles in Palisade for current trail conditions. Park at the river launch site approx 200 yards north of the trailhead. The trail begins next to a large gate, start the climb up and around the irrigation ditch. Scariest ride of my life. Insane amount of exposure, 90% of this ride is a no-fall zone. Rating double black because of exposure. Rode lower loop. So fun! Very technical. Disc brakes killing me!! Great, but windy!! Some tech and some flow - it’s got it all. Very narrow in spots and plenty of technical sections on the ascent. 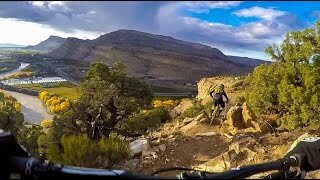 Riding one of the many tech spots on Palisade Rim.